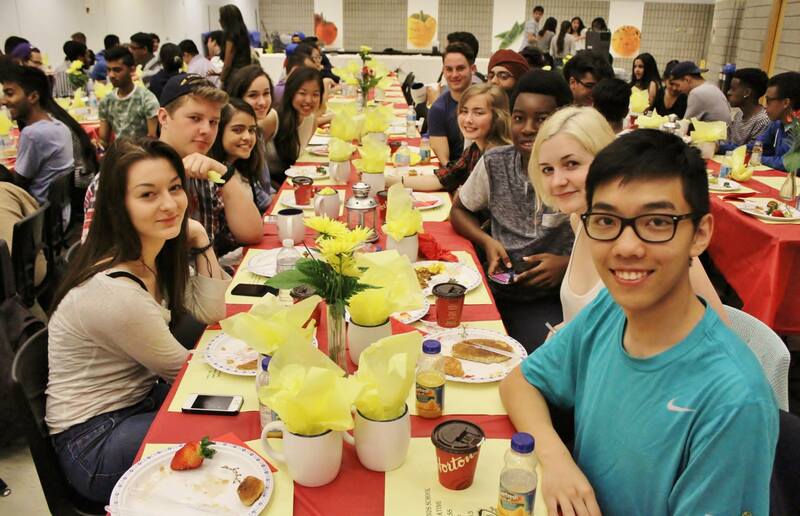 Grad Breakfast is a wonderful high school tradition where the graduating Grade 12 students get together one last time and enjoy breakfast as a group. This is an excellent opportunity to celebrate the hard work and achievements of the graduating students. The Grade 11 students serve the Grad Breakfast for the graduating Grade 12 students, generally during the last week of the class. It may also be a charity event and the money generated may be send to a deserving charity. This occasion also marks the passing of the mantle to the Grade 11 students, who will now be the seniors in the coming academic year. 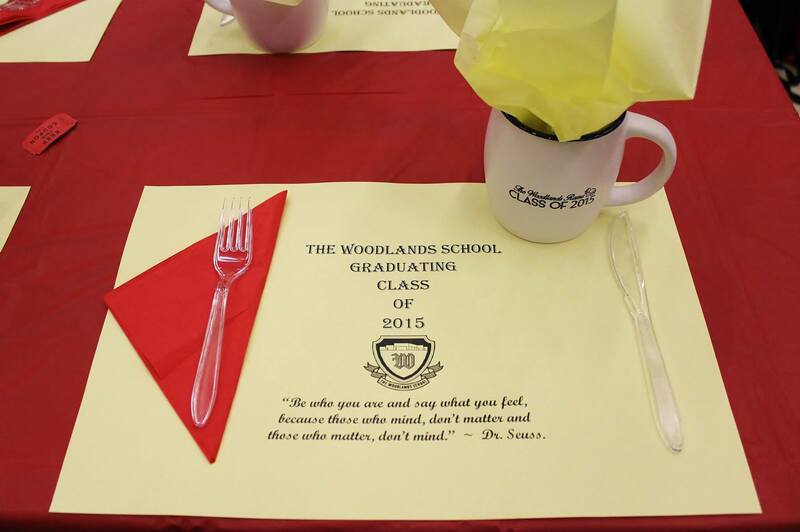 The Woodlands Secondary School from where our son Nikhil is graduating from, had their Grad Breakfast on Friday, June 12, 2015. The occasion is also used to select the valedictorian from a pool of applicants. The prospective candidates apply to run as a Valedictorian and the application got to be validated by two high school teachers. All candidates have to deliver a short speech at the Grad Breakfast, in front of the graduating Grade 12 students. The term ‘Valedictorian’ is an Anglicized derivation of the Latin ‘vale dicere’ meaning ‘to say farewell’, historically rooted in the valedictorian’s traditional role as the final speaker at the graduation ceremony. So the valedictory address generally is considered a final farewell to classmates, before they disperse to pursue their individual paths after graduating from the high school. The major criteria for the Valedictorian applicants was that the valedictorian must be a well-rounded individual whose accomplishments reflect the values of the school community. The recipient of this honour would have to meet the requirements for Graduation with a minimum of 30 credits; must be a honour student (80% average) from Grade 9 to 12; have demonstrated respectful behaviour in school as well as in the community at large; have not been in any discipline cases; must be a positive role model for the junior students; must have demonstrated leadership in various aspects of school life throughout the school career; and be able to represent the entire graduating class. Nikhil along with four other classmates had applied to be the Valedictorian. After the Grad Breakfast, all five candidates delivered their speeches. Nikhil spoke about the changes the graduating students are going to bring to the community, the country and the world. Click here to listen to Nikhil’s speech on YouTube. The graduating students were asked to vote online to select their Valedictorian. This was not merely a popularity contest, but the chances of an unpopular candidate winning it despite an awesome speech is very slim. Nikhil was confident that he would win it. After a few days it was announced that Nikhil was selected as the Valedictorian for 2015. Being a Valedictorian, it will surely confer one bragging rights and will also and a line to one’s resume and will also look good. It normally does not provide you any extra boost for your university admissions, but for sure, the admission panel will take a close look at it. Now Nikhil had to nominate one of his teachers to introduce him as the Valedictorian at the Commencement. He chose Miss Pils, his French teacher. Ms Pils is the only teacher who taught him for all the four high school years. She was the one who recommended Nikhil for the cultural and educational exchange programme in France based on his performance in French. As per Nikhil, one month he spend in Nantes, France with the Le Floch family was very fruitful and memorable. It was not only an important career milestone, but also a personal one for him. It had a telling impact on Nikhil’s outlook and conduct. The Valedictorian has to deliver the Valedictory address at the ‘Commencement’, to be held in October 2015. There is no greater recognition of a graduate’s achievements than a high school graduation ceremony, or Commencement. Diplomas are conferred or handed out to graduating students. Various award winning graduating students are honoured during the ceremony. The speakers selected for this event often include community dignitaries, alumni and the valedictorian. During our daughter Nidhi’s Commencement in 2009, it was Ms Hazel McCallion, the then Mayor of our city Mississauga (Please click here to read more about her), who delivered an inspiring motivational speech to the graduating students. US senator Orrin Hatch aptly said about High School Commencement that there is a good reason they call these ceremonies ‘commencement exercises’, as graduation is not the end; it is only the beginning. I am happy to read that Nikhil has been voted as the valedictorian. Our congrats and best wishes to him. He is proving to be a chip of the old block. You have very beautifully explained about the school graduation process. Congrats & Best Wishes to Nikhil. I am sure he would do his well wishers proud by his accomplishments. Keep it up. This article very nicely explains the tradition of Grad Breakfast . Congrats to Nikhil. Now I can say I know this guy he is Reji’s Son. Good article on this tradition. This title would get him to good school. Ofcourse, these blogs do help outsiders like me to understand and form considered opinion on most topics with in a matter of minutes which otherwise would have taken years!